When I was a beginning knitter, I picked knitting patterns based on the cover photos, barely even reading through them before casting on. I learned a lot because I tackled new projects without fear. (Who knew that I was "supposed" to be afraid of intarsia? or cables? Not me!) Unfortunately, I also ended up with many disappointing finished objects because I did not know how read the patterns critically and make adjustments as needed. Now I am older and wiser, and I sometimes read through patterns a little more carefully. Case in point: I thought that I was all set for the Knitting Olympics until Jenifer posted a link to this sweater pattern at Elann. It was love at first sight! Let the swatching begin! Except--once I stopped admiring the photo and actually looked at the pattern--I realized that there are some Issues. I should note that this is a free pattern which clearly states that it is written for "intermediate" knitters who can make adjustments as needed. The pattern is more "vague directions" than "detailed map." It is only written for one size, and there are no charts. The instructions for integrating the increases into the lace patterns are vague at best. Now, I think that this is fair, since I am not paying anything for the pattern, and the design gives me a great starting point. So when I talk about the Issues, I am not complaining about the pattern per se; I am just pointing out the things that I would need to adjust. 1. Good: it's knit from the top down, with raglan sleeves, which tend to look good on me. Not-so-good: the raglan shaping is the basic "knit into the front and back of each stitch before and after the marker" kind, which I don't think makes the most attractive lines. So I would have to pick a different increasing technique and keep track of that while also doing a lace pattern. 2. Good: I like that the sleeves and the body are different lace patterns. Not-so-good: You use the main lace pattern for the yoke of the sweater, then start a different lace pattern on the sleeves once you separate them from the body. Does this strike anybody else as odd? My preference would be for the sleeve to have the same patterning from shoulder to wrist. So I looked at the pattern for the lace on the sleeves to see if I could do it that way. It's "Milanese Lace" from one of the Barbara Walker books, but the pattern writer adapted it for knitting in the round, which is how she knit the sleeves. However, the yoke is not knit in the round. Hmm. I quickly rewrote the (simple) pattern to adjust for knitting flat and did a quick swatch. Yep, looked fine. I could start this at the top of the shoulders and then just continue the sleeves with back-and-forth rather than circular knitting. 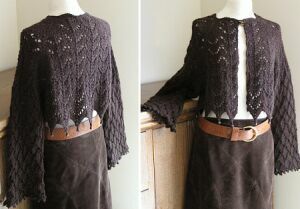 Except--the Milanese Lace is an eight row repeat, while the Horseshoe Lace on the body is a ten row repeat. So I would have to keep track of two different lace patterns, on different rows, while knitting the yoke. And doing raglan increases. Which is doable, but it would require some concentration. 3. Good: no buttonholes to factor in. My buttonhole math is abysmal at best. Not-so-good: the front edges are finished with a row of single crochet. This never works for me. My edges always curl. So I would need to factor in some sort of a narrow front edging, probably in garter or seed stitch. So--do I still like the sweater? Yes. Is it an Olympic Knitting contender? Sadly, no. Too much math, too many adjustments, too many simultaneous things to track. I think I am back to Plan A.